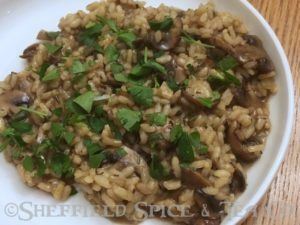 Mushroom Risotto is one of the classic ways to make risotto, which can be traced back in Italian cookbooks and literature for hundreds of years. Using Arborio rice, gives it its signature creamy texture. Portobello mushrooms adds a full, savory flavor. Adding Porcini Mushroom Powder to the rice while cooking adds the nutty flavor the porcini is known for, giving our Mushroom Risotto a fuller flavor, especially when dried porcinis aren’t always available. Risotto is served as a first course or as a side dish, along side the entree. We like to serve our Mushroom Risotto with Chicken Piccata, which we made while preparing this recipe. Click HERE for our Chicken Piccata recipe. You can also double the recipe for a larger dinner crowd, or add grilled or sauteed chicken breast slices for a complete meal. Pour the chicken (or vegetable) broth in a medium saucepan. Warm and keep warm over low heat. Heat 1 tablespoon of oil over medium heat in a large skillet. Add 1 clove garlic, ½ of the onion. Cook about 5 minutes until translucent, stirring constantly. Add the mushrooms, parsley, thyme, bay leaf and butter. Saute until lightly browned, about 4 to 5 minutes. Add the salt and pepper. Gently stir to combine. Remove from heat, set aside, and cover to keep warm. Whisk the porcini mushroom powder into ½ cup of the warm chicken broth. Whisk well to eliminate any clumps. In a medium saucepan, over medium heat, add the remaining 1 tablespoon of oil. When it starts to shimmer, add the remaining garlic clove and half of the onion. Add the rice and immediately stir until for 1 minute until it is coated and opaque. Stir in the wine and cook until it is nearly all evaporated. Add the porcini broth, stirring until the rice has absorbed the liquid. Add the remaining broth, ½ cup at a time. Continue to cook and stir, allowing the rice to absorb each addition of broth before adding more. Gradually adding the broth, stirring and allowing the rice to absorb it before adding more lets the rice release the starch, giving the risotto its creamy consistency. The risotto should be slightly firm and creamy, not mushy. It’s better to have a little extra liquid than too thick and solid. Add the mushrooms back into the rice mixture. Stir in for a minute to allow the mushrooms to heat back up. Stir in the Parmesan cheese. Cook about 30 seconds or so until melted. Serve with the chopped parsley garnish.